Hello video pals, it’s Andy Gesner and the staff from HIP Video Promo, here with a follow-up clip from one of the most talked-about indie bands of the year. If you haven’t heard about Foals yet, it’s a safe bet that you don’t follow the rock press. Since we sent you their kinetic clip for “Balloons”, the Oxford quartet has been the subject of countless articles and pieces in magazines and on websites. Such has been the excitement generated by Antidotes, their frenetic, surreal, elliptical, and wholly engrossing debut album. In their home country, Foals have already landed two singles in the Top 40; Antidotes, meanwhile, reached #3 on the album charts. 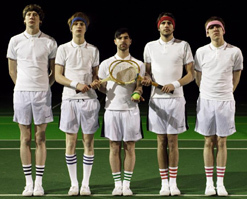 The group has become a regular sight on British late-night television and mainstream talk shows (they’ve performed on the influential Later With Jools Holland); not a bad showing by a gang of art-punks with a totally uncompromised vision, a math-rock background, a provocateur’s impish sensibility, and a will to make a racket. Foals’s reputation for high-quality, challenging dance-punk has preceded them stateside – even before the American release ofAntidotes, Kelefa Sanneh was already singing their praises in the New York Times. “They evoke that mythical, ever-recurring moment,” he said of the band’s performance at the Bowery Ballroom, “when young noisemakers hike up their guitar straps and start playing dance music.” Since the album dropped, press interest has only intensified – and U.S. reviews of Antidotes crackle with the rush that comes with the discovery of a major new act. In an ecstatic review on Drowned In Sound, Mike Diver praises Foals’s pop smarts and catholic tastes, and predicts inevitable commercial success for the band: “all this from five guys raised on a steady diet of punk rock, who still cite Charlottefield as one of the most important domestic [British] acts of the moment, and Sweep The Leg Johnny as American greats. They’re not meant to be making pop music, right? Wrong!” In the All-Music Guide, Marisa Brown is more succinct, but no less enthusiastic – Antidotes, she guarantees, lives up to the hype. The bracing “Red Socks Pugie” is a centerpiece of the album: three minutes of barbed-wire six-string and rapid-fire drumbeats bookended by an atmospheric intro and outro. In his characteristic yelp, Yannis Phillipakis sings of agitated hearts and wasp’s nests in his head; it’s all dizzy, deliberately unstable, and stealth-hooky. Here is material fissile enough to stimulate anybody’s pop Geiger counter – an underground punk hit sure to animate dancefloors and bedrooms all summer long. Foals has now worked with the imaginative Dave Ma three times; it’s a sure thing that the innovative video director understands their aesthetic and their ideology. Ma’s clip for “Red Socks Pugie” offers some of both – arresting imagery shot in home-movie style, playful and near-pastoral (but somewhat ominous) frames of the bandmembers, and archival footage of nuclear test explosions. The procession of the clip is fascinating: it begins with the members of Foals standing in the weeds beside an old reservoir. They’re enjoying themselves, but the strange light and the impassive tower blocks looming in the background indicate what’s to come. Then, just as “Red Socks Pugie” kicks into overdrive, Ma cuts away, and we never see the group members again. In their place are animated diagrams of a human heart in action, and Quonset huts and trees leveled by thermonuclear blasts. Ma times the detonations to coincide with the song’s dramatic guitar blasts; it’s bracing, but unnerving, too. By the end, the mushroom clouds and trees of nerve endings are cleared away, and there’s nothing on the screen but a sky at sunset, colored clouds floating in the air like red corpuscles in the bloodstream. As always, Sub Pop has delivered fantastic video that you and your viewers are sure to embrace. We’ve got copies ofAntidotes on hand for all of your on-air giveaways, so drop us a line to get your hands on them! If you need more info, call Andy Gesner at 732-613-1779 or e-mail us at HIPVideo@aol.com. You can also visit www.SubPop.com, orwww.WeAreFoals.com to find out more about Foals.